The Sharks are heading straight into the qualification series to stay in the Elitseries. The first chance is a best of three games series versus Alby, away. The team is heading to Alby on Friday for a double header on Saturday. If no team win both games a third and directly decisive game is played on Sunday. The winner of that series will stay in the Elitseries. The team who loses that series gets a second chance towards the winner of regional series play off in a best of three games series. The games will be played at the home park of the Elitserie team. The team who wins that series will get the Elitserie spot. We wish the Sharks the best of luck this weekend! This entry was posted in Baseball and tagged Alby Stars, Gothenburg Sharks on August 29, 2013 by Marcus. The Gothenburg Sharks are going to play Alby away to directly qualify to stay in the Elitseries. The games are already in your calendar if you subscribe to it. The games are scheduled to 31 of August with a double header. If no team win both games a tie breaker game will be played on the 1st of September. All games of that series are played in Seagull Park. The teams that wins the series end the season there and then. The other team will get a final chance to stay in the Elitseries in a three game qualification series versus the Regional series playoff winner in mid September. This entry was posted in Baseball and tagged Alby Stars, Gothenburg Sharks on August 13, 2013 by Marcus. Pre game Karlskoga @ Gothenburg Shark – Shark Park. We’re looking at a double header this Saturday. First game starts 1300. What can we expect from the games? What are the stakes? Gothenburg got one win versus Alby and one versus Leksand with six games remaining of the regular season. The Sharks ended the 2010 season with six wins after 22 games. There is still a chance to not score a all time low for the Sharks. WIth double losses the upcoming weekend the chances will be close to none to not set a new all time low. Karlskoga Bats on the other hand is on the other end of the series. Only one game behind Stockholm and they are looking for the number one spot with home game advantage in the final. Stockholm played Sundbyberg last night in a game that was cut short due to darkness. Stockholm was ahead 11 to 5 at the time. A new game is scheduled by tomorrow. Karlskoga is probably looking for two easy wins to stay alive in the run for the number one spot. Could it be that the strong Karlskoga could underestimate Gothenburg? This game will be Karlskogas first game since Sundbyberg away on June 8. Karlskoga won game one 2-7 but lost game two 11-10. Their import Shawn Hetherington pitched six innings (max for an import) of game one (ERA 2.02). Kent Karlsson pitched game two and gave up 18 hits and 11 runs in seven innings. Paul Waterman who has been very good the past seasons pitched only 2.2 innings in game one. His ERA is a solid 2.67 with 30 innings pitched. Could we suspect some injury that prevents Waterman from starting? He started versus Alby June 1 but pitched only three full innings before Kent Karlsson re-leaved. What could we expect from the Sharks? We have struggled with the defense for most of the season. From time to time the defense works excellent but that feeling has mostly being punctured during some part of the game letting a bunch of runs. Offensively the Sharks has the capabilities to get on base versus any team this year. There seem to be some sort of hang up when players reaches base that prevents the team to capitalize on the possibilities in the extension a fan would appreciate. The team haven’t earned the extra little things that makes it all fall in place for some reason. But there is still time to make that happen. A must when the team heads to the qualification series to stay in the Elitserien. Good luck on Saturday! Make the plays and fire up your bats! This entry was posted in Baseball and tagged Gothenburg Sharks, Karlskoga Bats on July 25, 2013 by Marcus. Looking through the stats from the games versus Alby it is kind of frustrating on several levels. Check out the average that the Sharks got. That’s not bad numbers! For some reason the numbers just don’t work for us! A loss five to four away should have been the other way around. The second game illustrates the pitching problem that the Sharks has right now. Not the pitching in that game in particular, but that number of games that we had against us over and over again. Frustrating. To make it more than frustrating we can’t blame anyone in particular. Five games was lost in the seventh because we failed to score more than three runs! Only 14 games of the entire season did come up with a winner not scoring double digits. 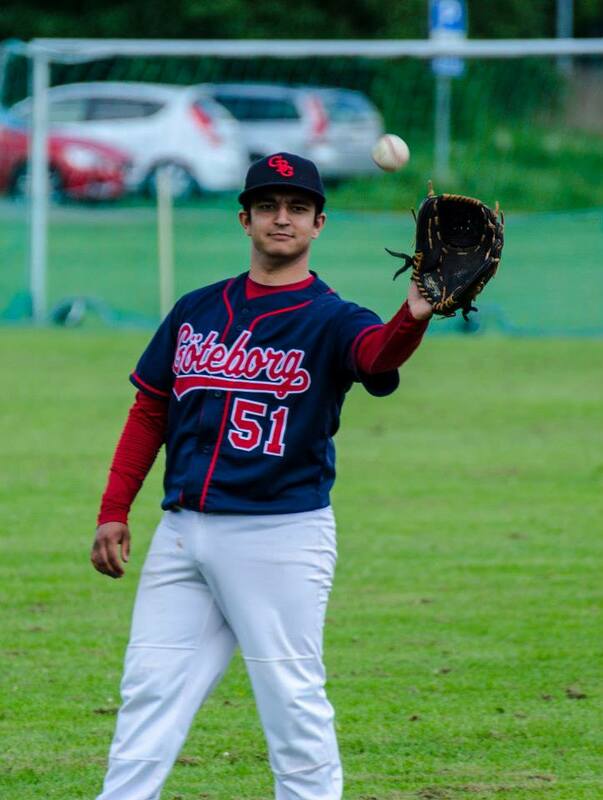 That said, one must be impressed by Alby players such as Demond Wiltshire playing second base, third when visiting Gothenburg. Almost taking as many walks as at bats. His six errors during a hundred innings (perfect at third base) is impressive! The youngster Emil Sahlin got a bright future. Already pitching at a high level. His ERA of 9+ is leveraged by the number of walks. (Walking over two per inning). If the coach could align to the rules of how many innings a junior are allowed to pitch, this guy has a bright future (He pitched more than he was allowed to when the team was visiting Gothenburg) We won that game however. When Alby was visiting Gothenburg I was also impressed by the stamina and stubbornness of Raul Lozano. From where I was standing I could not see that he was born 1960 when pitching a nine inning game. Today I must recognize a true fighter! A guy that stands up for the Sharks regardless if it is for a Elitseries game, the regional team or for our youngsters. He is a role model for any team! Thank you Joe Lankford. This entry was posted in Baseball and tagged Alby Stars, Gothenburg Sharks on June 13, 2013 by Marcus. Karlskoga was too tough for Gothenburg this weekend. The Sharks failed to take any of the two games to nine innings losing 11-1 and 16-5. We don’t have any more details of the games as of now, waiting for heatstat to get updated with the game details. Gothenburg will have to consecutive home games the upcoming two Saturdays. Leksand this Saturday (25/5) and Stockholm (1/6). 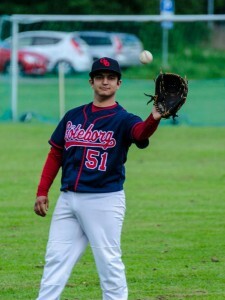 This entry was posted in Baseball and tagged Gothenburg Sharks, Karlskoga Bats on May 19, 2013 by Marcus.